Float Note, a convenient floating scratch pad. 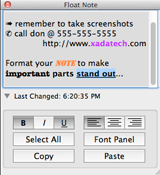 Tired of overly complicated notepad applications with excessive graphics and features? 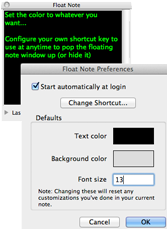 Float Note provides a single note taking window that appears on top of all your other windows. You can easily show/hide it through a shortcut key or menu item. 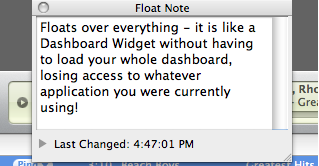 When active the Float Note window appears above most other windows. This gives you quick access to your important info, without pulling you out of the work you are doing. 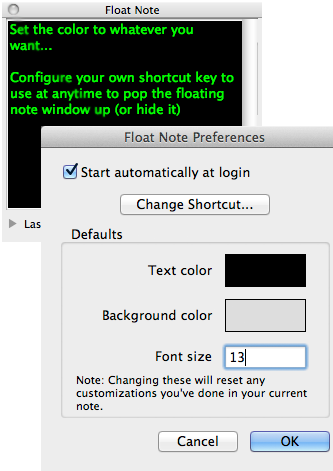 Access your floating notepad through a menu item, or through a customizable shortcut key that works from anywhere. 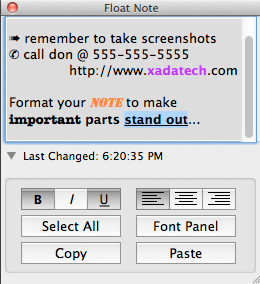 Basic formatting options help you organize your note. Pick the color scheme you like best.